Smart co-op shooting slightly undermined by poor stealth mechanics and dogged insistence on withholding the best toys. In theory, the job was easy. But then again, aren't they all? Me and three other wiseguys would hit this bank, break into the vault and make off with the cash housed within. Being the people person that I am, my job was to make sure none of the customers got any funny ideas about being a hero, calling the cops or whatever. So after I'd killed the security guard outside and sweet-talked the dispatcher on the other end of his pager, I'd waltz into the lobby – all calm and serious, like – and start tying up those innocent bystanders. In the meantime, our safecracker would kindly persuade the manager to hand over his keycard, shut off the security system and get drilling on the vault, while the two other members of our operation searched for any civilians we'd missed in the backrooms and kept an eye outside. Easy, right? This is how it went down. The back door was open on this run – which was great, since it meant the manager would probably go for a stroll outside. The problem was an extra guard, patrolling the carpark and heading up on the roof every few minutes. Quick change of plan, then – I'd take out the roof guard, handle the pager, etc, then wait on the roof for my colleagues to take out the second guard and the manager at the same time. Then I'd rush downstairs and start introducing the bank's patrons to Mr Cable Tie. You've gotta know how to improvise in this business, after all – there's no room for linear thinkers on my crew. So up on the roof I slip on my mask, whip out my silenced pistol, and everything goes to hell. My pistol's definitely silenced, but clearly not silenced enough, because a few traitorous decibels leak down to alert one of the civilians inside. They must have had the police on speed-dial, because seconds later we're treated to the wailing screech of a siren. Time to go loud. In many ways, the moment where everything goes wrong is the heart of this cooperative first-person shooter. The following seconds of panicked improvisation, when the brilliantly pounding dance music kicks in, plans get reformulated and roles reassigned on the fly, deliver some of the most intense cooperative thrills I've ever experienced outside of a game of Left 4 Dead 2. 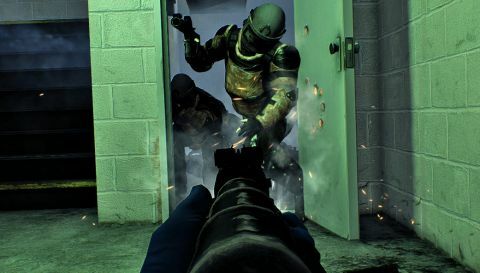 But it's also the heart of Payday 2 in another respect: it's the point where vague, unclear game mechanics and a steep, pointlessly restrictive upgrade system lets you down. Payday 2 isn't a stealth game, but it pretends to be, as the majority of heists start off with you casing the joint. There's something powerfully evocative about these moments: the game utterly sells the heist fantasy as you and your friends coolly evaluate the guards and security systems of whatever establishment it is you're about to ransack – a trap ready to spring. But the developers don't deliver on this build-up. The moment you don your masks and start taking out security guards, someone blunders, or something goes spectacularly wrong. Often, it's your fault: a team member running into the view of a security camera, gun drawn. Sometimes it's due to fuzzy rules, even if you are still technically to blame, as was the case with my silenced gunshot being heard through the roof. But then there are the incidents where you have nothing to fault but the game: an untouchable civilian on the other side of the invisible walls that bound the arena, calling the police. When my team and I finally pulled off a slick, perfect heist we did so via a zero-tolerance policy toward these unpredictable innocent bystanders: we killed anyone on the periphery who couldn't be tied down. The near-inevitability of failure might be designed into the game, but it's a pity, as it renders the stealthier parts of the various skill trees less valuable. It also means that your choice at the outset of a mission between wearing unassuming civilian clothes or conspicuous body armour isn't much of a choice at all – unless you're prepared to restart until you get it right. Payday 2 wants you to fail because it's not actually a heist game but a heist-themed siege shooter. Some of the best levels realise this, and give you something to do other than sneak in quietly. Assaulting a meth den, holding off an attacking SWAT team, and then proceeding to cook your own batch of meth is a decent example of the kind of audacious stuff the game can, ahem, cook up, when not limited by missions that entail botched sneaky entrances followed by your team defending a drill boring its way into a money vault. The meth lab mission requires at least one team member to carefully add ingredients to the mixture at the correct time, while everyone else battles heavily armoured SWAT enforcers in the kitchen downstairs. The gunplay is vanilla, in that there are no gimmicks to learn or unusual game mechanics to master, but it's high-quality vanilla, with real vanilla pods. These weapons have genuine heft and spit out bullets in loud, percussive blasts. The game gains a lot from its siege structure, too. The environments you're defending have multiple exits, floors and entrances, and there's something about standing in your assigned entrance, counting on your allies to handle their side of the battle, that makes encounters with the increasingly tough waves of law enforcement feel more nuanced and tactical than perhaps they really are. Inevitably, something will go wrong at these moments too: the drill will jam, the meth cook will set fire to the top floor. The scrabble to fix whatever's gone wrong without being overwhelmed is a chaotic thrill. Payday is all about the hectic joy of improvising, about what happens after you and three friends abandon your best-laid plans. For that reason playing with random allies can be significantly less fun. Even if the host doesn't boot you for being too low level you'll rarely enjoy the communication every budding criminal outfit needs. Even if you've got a willing set of accomplices, you'll need to contend with the mission select screen. Rather than choose the job and difficulty you want, you have to wait for a contract you fancy to appear as a randomly generated node on the satellite image of a city. To be fair, I appreciate the idea here: the point of this is to make you feel less like a gamer dictating terms and more like a criminal accepting a job. It's definitely led to some authentic dilemmas on occasion, as I've consulted with my lobbymates while weighing the rewards of a high-risk, multi-part heist against the less glamorous payout for yet another jewellery store run. The problem is that you'll probably just wait for the mission you really want to appear, and since it eventually will the whole city map idea just becomes a tedious layer on top of the mission selection process. Perhaps the devs should have fully committed, and forced you to choose between a limited selection of contracts each time. Thankfully, the character progression menus remain clear enough, and Payday 2 offers a complex set of skill trees you can flit between on a whim. With four masked robbers on a job and four skill trees, the obvious thing to do is find three friends and pick your specialisation, but even then each tree has three distinct branches. The flexibility here is generous, fuelling creativity (I ended up making a crowd-control expert with elements plucked from the stealth tree) and you can respec whenever you wish. It's just a shame that everything – skills and weapons, masks and modifications – unlocks slowly, or worse, arbitrarily. I've had to retroactively forgive high-level hosts for booting me when I was a lowly level-one character, because the truth is that a beginner bank robber genuinely can't fulfil a specialised role within a team. Additionally, the game doles out access to guns ploddingly and access to weapon mods via an end-of-contract minigame liable to hand over gadgets that stick onto firearms you've never bought. Remember my not-silent-enough silencer from the bank rooftop? I can afford a better one according the upgrades menu, it just hasn't randomly unlocked yet. The more you play, the more abilities you unlock, the more you specialise within your crew, and the better you learn each heist's slightly randomised rhythms, the more fun you'll have. That's the irony here. The fantasy that Payday 2 sells is that it will enable you to become part of a slick, coordinated outfit of professional thieves, capable of slipping in and out of malls unnoticed and effortlessly outfighting heavy-duty SWAT teams. And it will. You just need to become that experienced criminal first.